50 years ago an invasion of 250,000 troops and 4,600 tanks of the Warsaw Pact (Soviet Union, Bulgaria, Hungary, East Germany and Poland) effectively ended the liberalisation reforms by Alexander Dubček's Communist Party of Czechoslovakia known as Prague Spring. Killing 137 Czechoslovak people and seriously wounding 500 on 21st August and in the following months. After 1938 (Munich crisis), 1948 (communist coup d'état), 1968 became another fatal "8" for this country. Yet even in 1968 the intervention forces were met with local resistance. By unarmed citizens, and passive but resolute resistance by an elite unit of the Czechoslovak People's Army. On 20th August 1968 a massive jamming of the Czechoslovak radars begun at 23:00. At the same time divisions of the Soviet Northern Group of Forces in Poland, 2nd Polish Army, 38th Soviet Army and the 11th Guards Army were heading south to Jablonec nad Nisou, Náchod, Hradec Králové, Olomouc, Ostrava and Žilina. In East Germany there were 9 divisions ready to invade Czechoslovakia, including the East German 7th Armoured Division, 11th Mechanized Infantry Division and 12th Border Brigade formed for this occasion. These forces were supposed to occupy Prague, Plzeň, and to close the South-West border of Czechoslovakia (with West Germany). The Southern Group of Forces strengtened with the Hungarian 8th Mechanized Division marched on Bratislava and Břeclav. Slovakia was invaded by the Soviet 38th Army and the Bulgarian 12th Mechanized Regiment from the East. The first invasion wave was formed by 70,000 men and 1,800 tanks crossing the borders from Poland, 35,000 men and 1,300 tanks from East Germany, 40,000 men and 1,500 tanks from Hungary; 20,000 men of rear services, technical support specialists and police followed. Soviet Marshal Grechko warned the Czechoslovak Minister of Defence General Dzúr that any armed opposition by the Czechoslovak People's Army would be broken by force. A group of Soviet officers was present in the Czechoslovak Army's General Staff to prevent any eventual coordinated resistance. The Czechoslovak People's Army was about 235,000 men strong by that time. Its numbers were recently strenghtened in an attempt by the Government to resist the Soviet intention to deploy Soviet troops in Czechoslovakia to fill the gap between the Soviet forces present in East Germany and in Hungary. It would hardly be able to resist the invasion by the "allies" which came, for most of the army, as a complete surprise and a shock. Reminiscences... in 1945 the Soviet Army was generally welcomed in Czechoslovakia, liberating most of its territory from the German occupation (1939-1945). 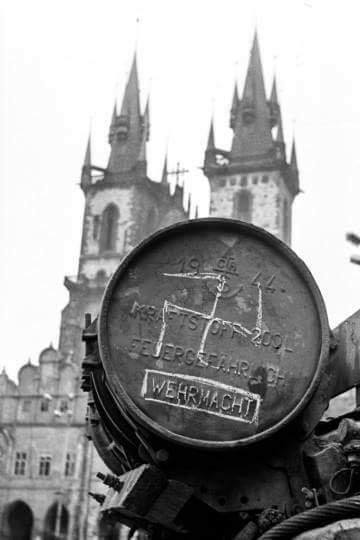 Yet in 1968 the invasion was nothing but another occupation by a foreign power... a photo taken in Prague in August 1968 shows a Wehrmacht fuel barrel on a Soviet tank. 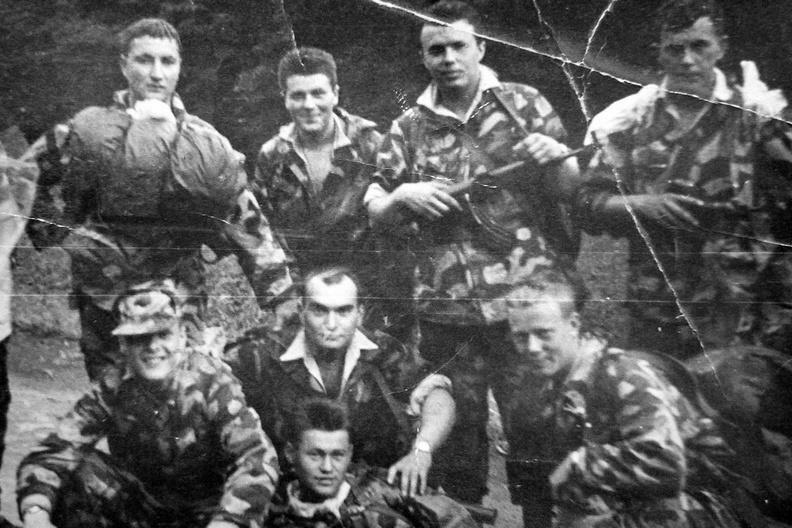 At 23:35 a group of the Czechoslovak Secret Security (StB), loyal and devoted to the Soviet Union, started preparations to receive the Soviet paratroopers at the Prague Airport. At 00:20 the Minister of Defence orders all troops to remain in the barracks, to fully cooperate with the invaders, and forbids any use of weapons. The first Soviet soldiers arrived to Prague Airport by 01:30, at 02:00 the airborne operation begun, the 7th Guards Airborne Division arrived to seize the most important targets in Prague, including the Government Office where the Soviet Paratroopers interned the Prime Minister Oldřich Černík. By 03:00 the Antonov An-12 and An-24 started to deploy the troops in Brno, Hradec Králové, Mladá, Mošnov, Náměšť nad Oslavou, Pardubice, Slatina and Žatec, the most important air bases of the Czechoslovak Army. And first casualties among the civil population occured. Miroslav Vlček, 20 years old, was hit by machine gun fire and killed in Liberec. At 05:00 the leaders of the Czechoslovak Communist Party including Alexander Dubček were arrested. At 06:35 the Czechoslovak Radio invited the people to meet the invaders with passive resistance. In reaction the Soviet Army opened fire on the National Museum in Prague, mistaking the building for the site of the Czechoslovak Radio. At 07:30 the first violent clashes between the invaders and the inhabitants of Prague started, with several killed and mortally wounded civilians around the Radio building. The building was seized by 08:30, at the same time the provisional studio of the Czechoslovak Television was also in Soviet hands. In Liberec six people were killed by reasonless fire, 24 were wounded. Etc. Etc. What was the reaction of the Czechosloavk People's Army? Most of the troops followed the orders issued by the Minister of Defence. Yet there was one regiment which resisted: the 7th Special Purpose Airborne Regiment in Holešov, Moravia, an elite unit of the army, about 800 men strong. Encircled by the invaders the paratroopers refused to surrender their arms. The Soviet officers knew the regiment well, and did not run the risk of open confrontation which would lead to heavy losses on both sides. The regiment even formed a task force of 70-80 men to liberate Alexander Dubček and Ludvík Svoboda, president of Czechoslovakia, from the Soviet captivity. The group left the barracks in covered trucks, and entrenched in nearby positions, to serve also as a reserve in case the Soviet troops attacked the barracks. The Soviet troops eventually found out the purpose of the unit and complained at the Czechoslovak General Staff, and the unit returned to the barracks a few days later. This isolated act of military heroism changed nothing in the course of the invasion. And there was a price: a year after the invasion, the regiment was disbanded, and its scrupulous officers were dismissed from the army. Despite the sacrifice of so many people, the invasion fulfilled its aims. Moscow reinstalled a disciplined puppet regime of Gustav Husák, and a period of so-called "Normalization" begun, and did not end until the "Velvet Revolution" in 1989.